My journey began when I was 4 years old, in Seoul, Korea. I earned my first and, soon after, second Dan Black Belt whilst in Korea, at the world’s taekwondo headquarters – Kukkiwon. After my family emigrated to the US in 1989, I maintained my desire to improve in the art of taekwondo. So I decided to continue my training and became 3rd Dan at just 19 years old. At this point my interest in supporting others grew into a passion for wanting to see the art taught as it had been taught to me. So I began teaching lessons at a local studio, giving me experience of teaching taekwondo before opening Han Bros with Master Jason. 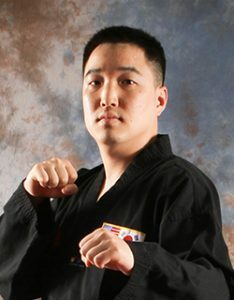 To not only be the best taekwondo master, but also the best teacher I could be, I continued my personal training to become a 4th Dan Master Instructor in 2004 and then onto a 5th Dan in 2008. I have been involved with taekwondo for over 30 years. This began at the age of 4 when I started going to classes to follow my brother, Master Steve. My belief in discipline helped me develop when I was a young student discovering taekwondo, this being a key principle of the art. I was also very energetic as a child (just ask Master Steve!) and so beginning to train in taekwondo helped me with this. I found the art worked with my love of high energy activities, not against it. It was something I was able to dedicate a lot of my energy and effort to, while also learning how important peace and dedication are. Me and Master Steve worked really hard to improve ourselves and each other before and after moving to the US. Since then, we have both achieved our 5th Degree Black Belts. We decided to open our own dojang in 2010 so that we could teach taekwondo the way we knew it should be taught, the way we learned it in Korea. The number of our students has grown since starting Han Bros TaeKwonDo, and in 2015 we opened our new studio in La Verne where I am Head Master.